We have another fun craft for your fine feathered friends for you today! 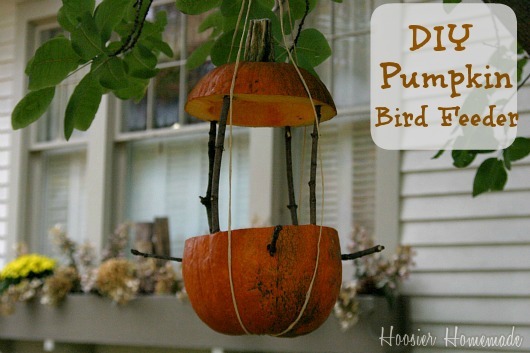 Doug and I had such a great time making these Pumpkin Bird Feeders and Bath, we are excited to share them. 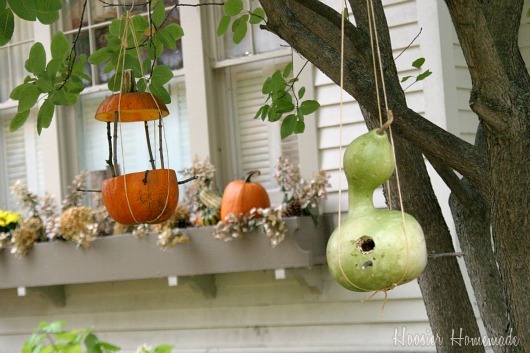 I have been wanting to try the Pumpkin Bird Feeder since last year, when Doug’s Aunt Mary emailed me the idea from Martha Stewart. We started with that idea for inspiration and expanded on the idea and changed it up a bit. After we got the feeder done, we decided it really needed a roof to keep the rain out of the feed. So we used the top from the pumpkin, added some thicker sticks and added the roof. 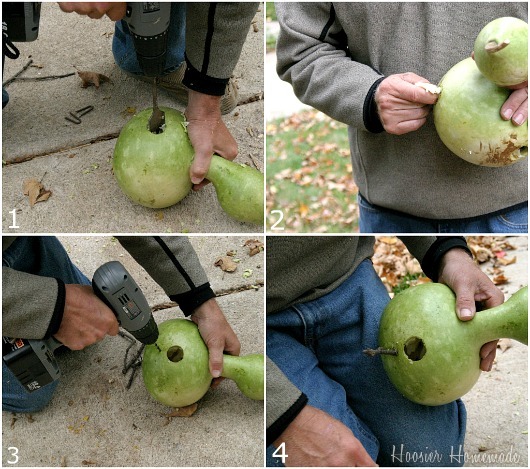 While we were at the Pumpkin Patch picking out the pie pumpkin, we decided to get a gourd and make another feeder. 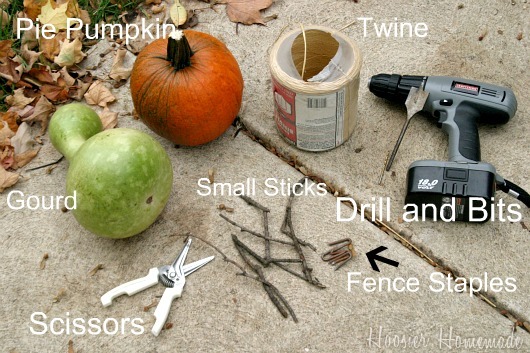 Attach the twine to the gourd the same way you did on the pumpkin, with a fence staple. Hang from the tree using a little wire. 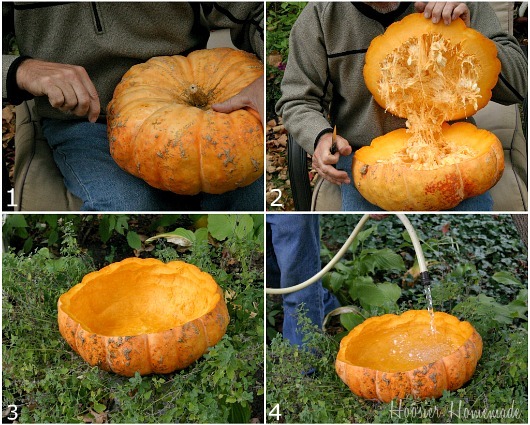 You will want a pumpkin that is wide and flat. I couldn’t find the name of the variety, do you happen to know? We placed the Bird Bath on top of a pot of cat nip that we had near the Front Porch this Summer, and then cleaned up the top a little, sat it on the ground and added some feed. The chipmunks and squirrels have enjoyed it! 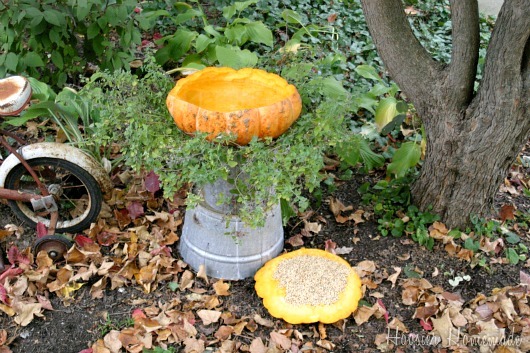 I think the Pumpkin Feeders and Bird Bath are a little eclectic, but I think they are super cool! And, not counting the Pennington Bird Seed that we had left from the Bird Seed Ornaments, we spent only $6 for all them! 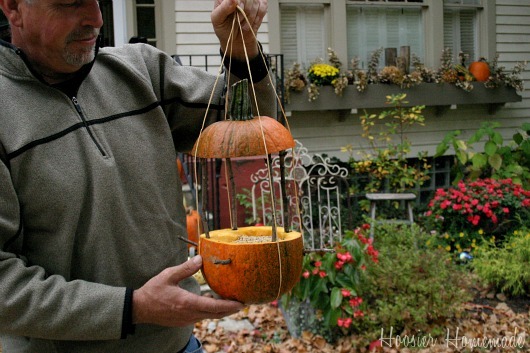 Do you have feathered friends that would love these little Pumpkin Feeders and Bird Bath? I bet your kiddos will love helping you make them too! oh my gosh, i love this idea! 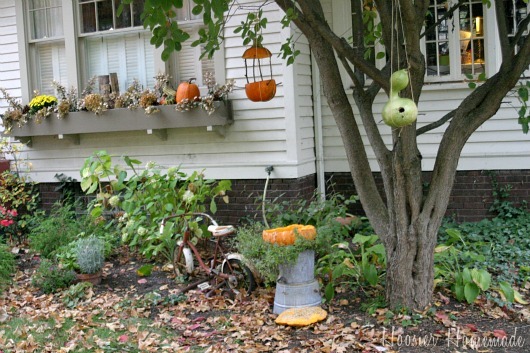 they are fabulous, especially that hanging pumpkin! 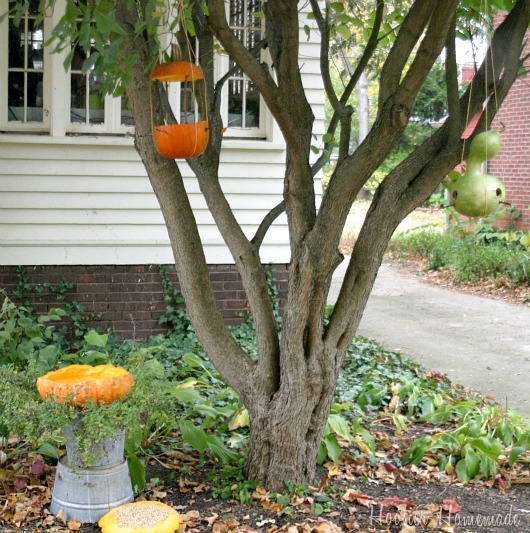 Great idea that just adds to the seasonal decor! I’m sure our feathered friends will love you for it too! how cute! I’m going to make one of these with my kids this weekend…what a great idea! found you through gina’s blog! Those are too cute! Everyone is celebrating Halloween, even the birds!! ADORABLE! I can’t wait to do this project with the kids. Thanks for sharing! 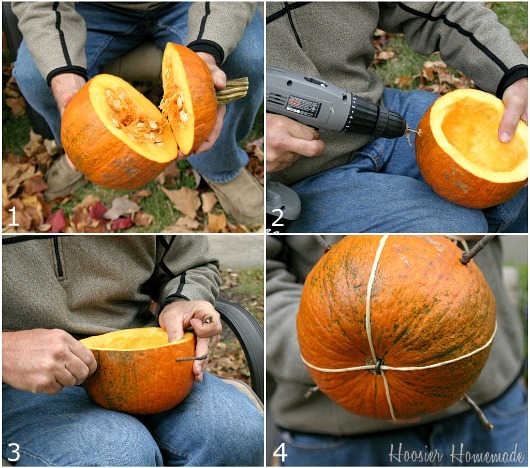 These are awesome ideas for use of a pumpkin. If I had the area and a tree to put it in I would give that bird feeder and bird bath a try. 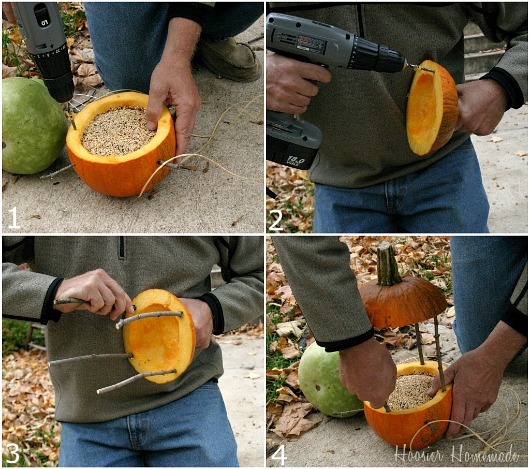 Genius… my kids would love this project!We have plenty of pumpkins left from the garden as well.